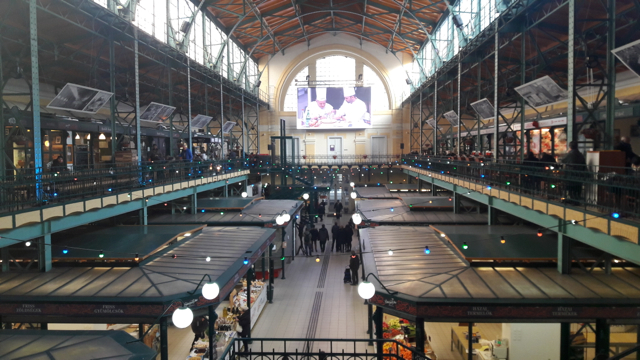 Goulash is one of the most well-known Hungarian food in the world, and not surprisingly it can be tasted in most of the market halls in Budapest. Trying a tasty goulash soup is an absolute must while you visit Hungary. 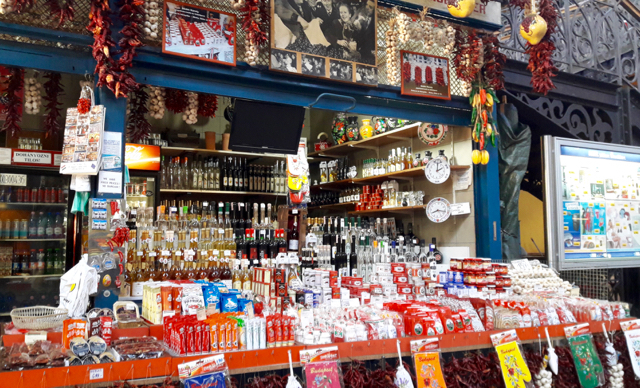 Goulash Soup tasting is included in the Downtown Market Hall Tour and the Great Market Hall & Wine Tasting Tour. The meal was originally prepared by the herdmen in Puszta in hanging cauldrons, over open fires. The herdsman called Gulyas prepared this one-plate meal from onion, paprika, vegetables and fresh meat. The shepherds used to live apart from the communities, cooked for themselves using only one cooking utensil, a metal hanging cauldron. Until the 1790s probably only the beef was typical, as they mainly held Grey Cattles on the pastures. Hungarian Grey cattle is an ancient breed of Hungary. Hungarian Grey cattle are robust and long-lived. Their long horns are directed upward and curved (ideal for making horn bugles and drinking horns). Goulash soup can be made from beef, veal, lamb or pork. Typical cuts include well-exercised muscles rich in collagen (shank, shin or shoulder), so the goulash derives its thickness from tough meat cooked slow. The collagen is converted to gelatin during the cooking process. To make Goulash soup use the Paprikash Method (sauté the onion in the oil until glossy, remove from the heat and add the paprika. Stir and add the meat with and water). Basically, it is the same recipe as Porkolt, but with more water. You can add spices like pepper, bay leaves, majoram or thyme. Diced potatoes may be added, when the meat is cooked. The potato will make the goulash thicker and smoother. 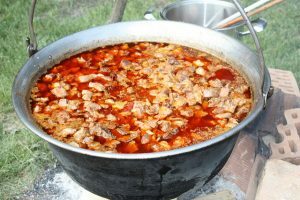 Goulash is often served with homemade noodles (Galushka or ‘Csipetke’). Galushka is a bit softer, while ‘Csipetke” is pinched by hand. Csángo Goulash: cooked with sauerkraut. Bean Goulash probably the second most popular goulash in Hungary. The hearty soup is usually eaten for lunch and the second course could be homemade pasta with poppy seeds, Hungarian Pencakes or dumplings with plums or apricots… so something sweet. 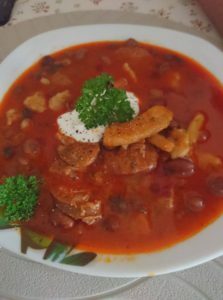 The secret of the good “Babgulyás” bean goulash is the smoked meat and paprika. 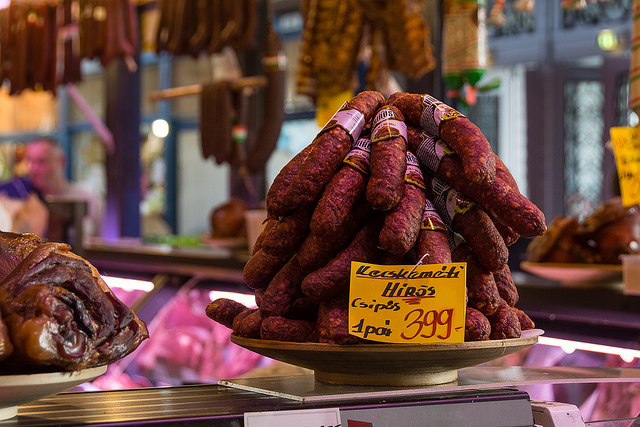 Smoked bacon and sausage slices are fried so that the diced onion can be sauteed in the smoky fat. 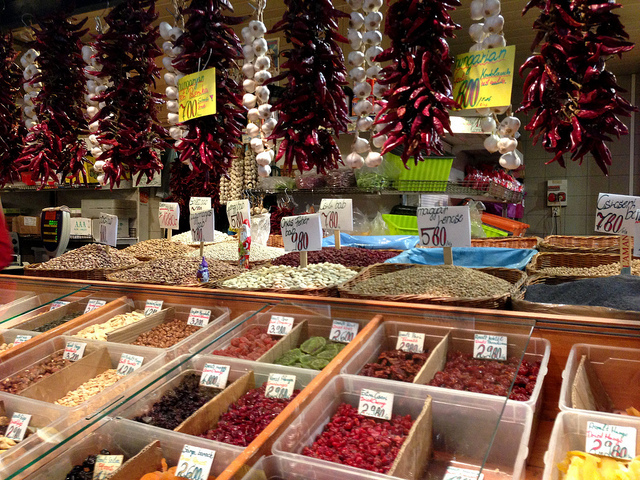 We can find a lot of different beans in Hungary, white beans, black beans, pinto beans, small or large ones. They are all tasty as a bean goulash.